Can you confirm these amateur observations of Aspidoscelis guttatus? Type locality: Mexico. Restricted to Veracruz, Veracruz, by SMITH & TAYLOR 1950.
flavilineatus: Mexico (Chiapas); Type locality: Mexico, Chiapas, Finca Orizaba, ca. 20 km SW Las Cruces, ca. 650 m elevation. striatus: Pacific slopes from Colima to Chiapas. Michoacán, Guerrero, Morelos. Type locality: “West Tehuantepec”, Oaxaca. Restricted to the city of Tehuantepec by SMITH & TAYLOR 1950. Comment Synonymy after SMITH & TAYLOR 1950. 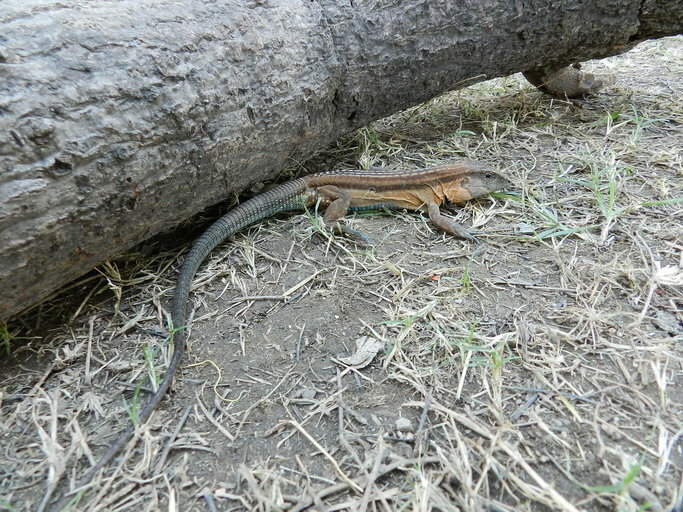 Belongs to the Aspidoscelis deppii group (fide REEDER et al. 2002). Types: Malnate 1971 listed 2 syntypes (ANSP 9579-80) for Cnemidophorus guttatus Hallowell 1855: 192. Alvarez DEL TORO, M. 1982. Los Reptiles de Chiapas. 3rd ed. México: Tuxtla Gutiérrez, 248 pp.